Olive oil is oil that is pressed from olives, the fruits of the olive tree. The process is incredibly simple.. you just press the olives and the oil comes out. But there is still one major problem with olive oil… it isn’t always what you think it is. Some lower quality versions can be extracted using chemicals, or even diluted with other cheaper oils. Therefore, buying the right type of olive oil is incredibly important. The best type is extra virgin olive oil. It is extracted using natural methods and standardized for purity and certain sensory qualities like taste and smell. Olive oil that is truly extra virgin has a distinctive taste and is high in phenolic antioxidants, the main reason why (real) olive oil is so beneficial. You are always told to cut back on fats and oils. But this is not the case with the oil obtained from olive trees. Olive oil is rich in monounsaturated fatty acid (MUFAs) which is supposed to be a healthy dietary fat. Most importantly, studies have suggested that nature provided dietary fats to the olive in the exact ratio that human beings need them. 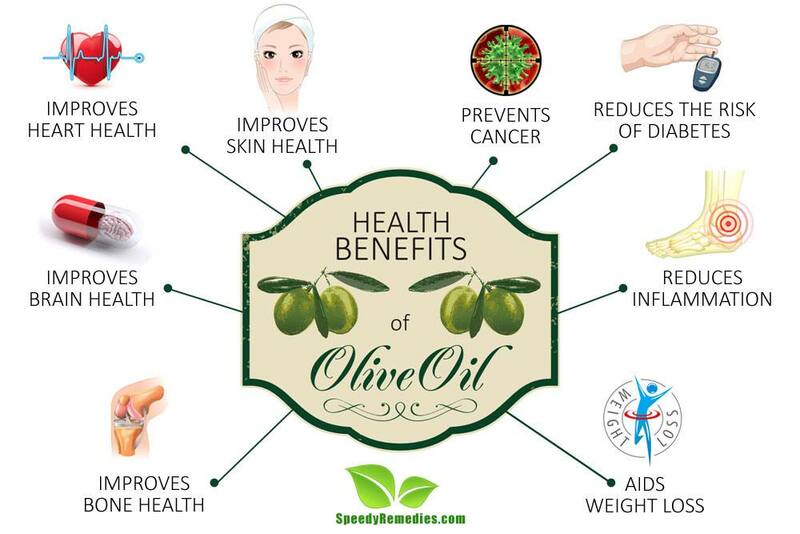 So this may be the prime factor why olive oil got well-deserved attention throughout the world, though it was primarily used in the Mediterranean diet for thousands of years. Whether you add it to your salad or roasted vegetables, besides adding wonderful flavor to them, this liquid gold can be used as one of nature’s best healing wonders. Olive oil is extremely beneficial for improving the health of your heart. The antioxidants and omega-3 fatty acid found in olive oil help in reducing LDL/bad (low density lipoprotein) cholesterol levels in the body that causes narrowing of the arteries and, thus reduces the risk of several cardiovascular diseases. Simultaneously, olive oil helps in increasing HDL/good (high-density lipoprotein) cholesterol levels in the body. Moreover, the oleic acid, monounsaturated fats and antioxidants in olive oil contribute to regulation of blood pressure levels. A 2004 study published in The American Journal of Clinical Nutrition substantiated the statement asserting that the intake of olive oil is inversely associated with both systolic and diastolic blood pressure. Further, a 2007 study published in the Pharmacological Research journal explained the various anti-atherogenic effects of olive oil that contributed to lower rate of cardiovascular mortality. Thus, olive oil is a boon for those suffering from any type of cardiovascular disease. Olive oil has favorable effects on your brain functioning and health. A 2012 study published in the Journal of Alzheimer’s Disease suggested that olive oil has beneficial effects on learning and memory deficits. Further, olive oil contains oleocanthal, a compound that removes abnormal proteins from the brain to decrease the risk of Alzheimer’s disease related neuro-degenerative dementias. Moreover, olive oil has positive effects on brain functioning and helps a great deal to reduce the risk of cognitive impairment. Olive oil is also greatly associated with reduced risk of depression, cognitive impairment and other neuro-degenerative disorders. Olive is yet another effective solution for those suffering fluctuating sugar levels in the body. It has beneficial effects on the blood sugar levels in the body along with regulating the insulin activity. The monounsaturated fats and the antioxidants in the oil help in keeping up with the triglyceride levels in the body, thus regulating blood sugar levels in the body. Owing to low saturated fats, diets containing olive oil are highly effective in reducing the risk of developing diabetes. A 2009 study published in the Current Diabetes Reviews journal demonstrated that Mediterranean diet rich in olive oil can reduce one’s risk of Type 2 diabetes by almost 50 percent as compared to a diet low in fats. Add about 2 tablespoons of olive oil in your daily diet to manage your blood sugar levels and reduce the risk of developing diabetes, specifically Type 2 diabetes. Olive oil is a major contributor towards the path of weight loss. Although high in fat, olive oil is composed of healthy, monounsaturated fat that helps with weight loss. A 2009 study published in the European Journal of Clinical Nutrition asserted that a diet rich in extra virgin olive oil is associated with higher levels of plasma antioxidant capacity in the body leading to a reduction in body weight. Furthermore, a 2013 study published in the Food Chemistry journal observed that even the smell of olive oil is helpful in weight loss as it causes a feeling of fullness, thus reducing hunger and sugar cravings. Due to the presence of antioxidants and monounsaturated fats, olive oil serves great purpose to prevent and treat cancer. Olive oil reduces the oxidative damage caused by the effect of free radicals in the body, thus reducing the risk of cancer. Olive oil specifically works best for reducing the risk of breast cancer. A 2005 study published in the Annals of Oncology journal proved that the individual fatty acids found in olive oil help to regulate the behavior of breast cancer cells in the body. The study observed that oleic acid, one of the essential fatty acids found in olive oil, triggered cancer cell death, thus reducing the risk of breast cancer. Olive oil can also be used to reduce the risk of developing respiratory tract, upper digestive tract, prostate and colorectal cancers. Olive oil contains a plethora of compounds, vitamins and minerals that can leave your skin looking, younger, fresher, softer and smooth, while maintaining its overall health. Rich in vitamins A and E, omega-3 fatty acids and several other minerals, olive oil works as a natural moisturizer for your skin. Moreover, olive oil contains higher levels of SPF (sun protection factor) that make it an incredible natural ingredient to protect the skin from harmful radiations of the sun. Also known as ‘liquid gold’, olive oil is one stop solution for all your skin troubles! Olive oil contains a number of antioxidants, proteins, genes and phonelic compounds that make it an effective anti-inflammatory. The anti-inflammatory property of olive oil thus helps deal with chronic inflammation that leads to severe heart conditions, cancer, metabolic syndrome, Alzheimer’s and diabetes. The key antioxidant in olive oil is oleocanthal, a compound that works more like ibuprofen (an anti-inflammatory drug), to reduce swelling and inflammation. A 2011 study published in the Current Pharmaceutical Design journal proved that olive oil contains numerous phenolic compounds that impart potent anti-inflammatory properties to the ingredient. Moreover, olive oil contains oleic acid, a fatty acid, that itself brings down inflammatory markers in the body. Olive oil contains osteocalcin, a protein that grants greater density to the bones and maintains their overall health. Moreover, olive oil improves calcium levels in the body which further leads to mineralization and calcification of bones, phenomenon required for optimal bone health. Thus, olive oil is highly beneficial for people suffering from osteoporosis as it helps increase the bone mass. Not only this, the anti-inflammatory property of olive oil makes it exceptionally good for inflammatory conditions like rheumatoid arthritis. A 2005 study published in the Nutrition journal points out that ingestion of olive oil showed a more precocious and accentuated improvement among patients suffering from rheumatoid arthritis. Journal of Alzheimer’s Disease: Extra virgin olive oil improves learning and memory in SAMP8 mice. Current Diabetes Reviews: Dietary patterns and prevention of type 2 diabetes: from research to clinical practice; a systematic review. Nutrition Journal: Supplementation of fish oil and olive oil in patients with rheumatoid arthritis.